Those who are tired of fighting off the summer crowds in Champagne Country will find a refreshing alternative in the quaint old town of Troyes, a little off the tourist track and therefore exuding plenty of genuine French appeal. Troyes has been settled since the Roman era and has a rich history and many interesting museums and old churches to visit. In the beautifully restored city centre, sporting quaint narrow streets, Renaissance mansions and pretty old houses, stands one of France's most magnificent Gothic cathedrals. Troyes has been lucky to avoid destruction during war, which is partly why it has so many historic buildings still standing; apart from the magnificent Saint-Pierre-et-Saint-Paul Cathedral, visitors should look out for other worthwhile old churches including Saint-Nizier Church, which has remarkable sculptures, the 13th-century Saint-Urbain Basilica, and Saint-Nicolas Church, a Gothic building dating back to the early 16th century. 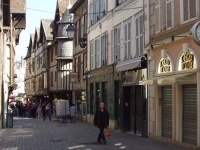 Strolling around the old part of town is one of the primary delights of Troyes, and there are numerous good restaurants and cafes. The city also boasts a private collection of art housed in the old Bishops palace, the Musée d'Art Moderne, that displays works by Bonnard, Degas and Gauguin.